Denim is a definite must have of the new Spring/Summer 2011 season as denim is not only comfortable but also exudes style. So take a peek at what you should be looking for when it comes to denim for the new season! The last season was all about skinny and boyfriend jeans but this new season brings a little bit more variety when it comes to denim. 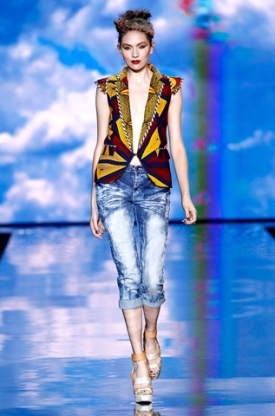 Go for artful denim which features different embroidery or colors to add some spice to the denim. Acid washes are also in and look amazing, especially if paired with different color fashion items. Mix and match different styles and go for an all denim outfit for a bold look, or go subtle but choosing to mix and match different fabrics with your denim! Pay attention to details and you will most definitely end-up looking “smashing” in your new hot denim outfit. Enjoy!